Are you an avid SOLIDWORKS user? Are you creative? 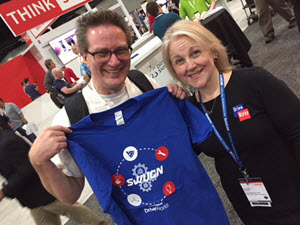 Do you want to see your very own design worn by the thousands of attendees at SOLIDWORKS World 2019? Then enter the SOLIDWORKS World T-Shirt design contest and show off your best work! Create a design for the front of a t-shirt that you feel embodies the SOLIDWORKS World Conference. Remember, the conference is in Dallas, Texas in 2019. SOLIDWORKS will let you submit unlimited entries, but each must be a completely new design. The submission deadline is October 29, 2018 11:59pm ET. SOLIDWORKS will choose the top design submissions that best represent the SOLIDWORKS World event. Next, SOLIDWORKS will open up the voting to everyone! You (and everyone you know) can then vote on your favourite design! Voting will take place between November 1, 2018 and November 26, 2018. 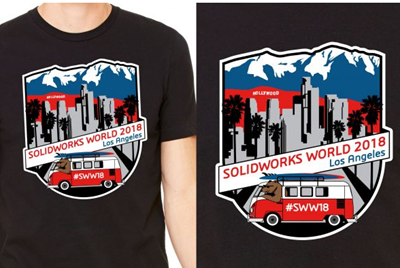 Your votes will decide the final three winners whose designs will be printed on the t-shirts to be distributed at SOLIDWORKS World 2019 for all to wear! Check Out Our SWUGN Sponsorship T-Shirts! 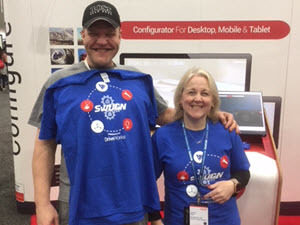 Each year at SOLIDWORKS World, SOLIDWORKS User Group leaders head over to our booth to collect their exclusive DriveWorks SWUGN t-shirt! 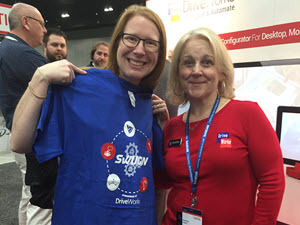 Heather, who is involved in running the SWUGN sponsorship program at DriveWorks, hands the t-shirts out, grabs a photo with the group leader and discusses how we can sponsor their upcoming meetings. Each year we design a new t-shirt, so watch this space for a sneak peak of our latest one! 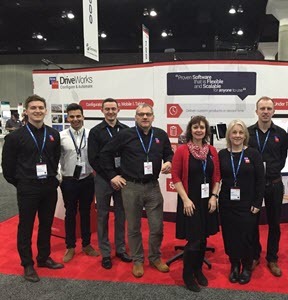 Heather really enjoys catching up with the group leaders and she’s looking forward to seeing you all again at SOLIDWORKS World 2019! Meet Us at SOLIDWORKS World 2019! SOLIDWORKS World 2019 in Dallas, Texas will be DriveWorks’ 16th year at SOLIDWORKS World! The event takes place from 10th – 13th February 2019 at the Kay Bailey Hutchison Convention Center. We’re excited to be a part of the action again – sponsoring, exhibiting, presenting, listening and learning! Pop by and see us in the Partner Pavilion and meet our CEO, Vice-President and several other members of our team. We’ll keep you updated with details of our design automation and CPQ presentations as we get closer to the event!